Mary Beekman leads Musica Sacra. This season Musica Sacra is celebrating both the 50th anniversary of its founding and the 30th year of conductor Mary Beekman's artistic leadership - and the icing on the cake of this year-long party was last weekend's "Mary's Playlist" concert, a compendium of Beekman's favorites from her three decades of conducting the group. 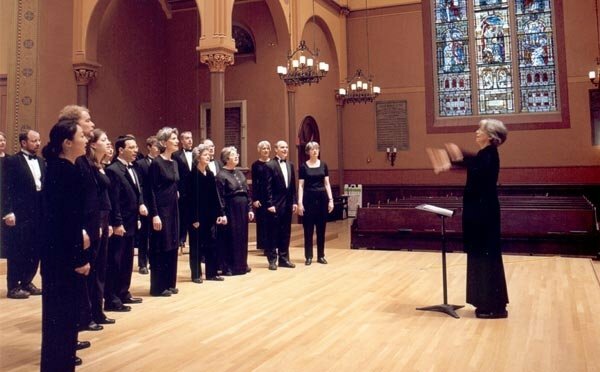 Few local arts organizations have had that kind of long-term relationship with a leader; by now, in fact, it's hard to imagine Musica Sacra without Mary Beekman, who was her usual gently authoritative and precise self onstage last Saturday. Her playlist wasn't really much of a surprise, either - fairly eclectic, yes, but generally moving and humane, flecked here and there with touches of open-minded whimsy and experiment. The group itself sounded much as it did when I heard them a year or so ago - Musica Sacra still is strongest in its sopranos, but Beekman nevertheless sculpts a rich and balanced sound, with a remarkably sensitive dynamic, from her assembled forces. And the chorus seems to know she's drawing out their best; particularly at the concert's close the mutual admiration of this little society was quite palpable, as alumni crowded the stage to sing along with the group's signature encore, the immortal "Teddy Bears' Picnic." Not everything on Mary's playlist was quite so heavy and dark - there were lighter selections to be savored, such as "Hello, My Baby" (yes, Michigan J. Frog's favorite aria) and "I Wanna Be Loved by You" (Betty Boop's signature tune). I think it's clear from these selections that Ms. Beekman has superb taste, but it's also an eclectic taste in formal terms, and so the concert ran the gamut from Elgar to Mäntyjärvi. I most enjoyed the mournfully beautiful "My Love Dwelt in a Northern Land" from Elgar, as well as James Erb's "My Lagan Love" and especially the haunting Civil War song "Tenting on the Old Camp Ground," which Union and Confederate soldiers may well have heard each other singing across the fields they were battling for. Meanwhile such onomatopoeic experiments as Norman Dinerstein's "Frogs" struck me as good ideas that sometimes outstayed their welcomes; but "Three Choruses from ee cummings" by Peter Schickele (yes, that Peter Schickele) was a delight both melodically and formally. And Mäntyjärvi's "Double, Double, Toil and Trouble" and especially Jim Papoulis's "Kolenna Sawa" ("All of Us Together") were pleasingly adventurous. Actually, some of the chorus needed to attack the stomps and body claps of "Kolenna Sawa" with more passion. But somehow you got the impression Mary would soon see to that.